Those who are not watching their budgets but who still value their dollar will want to know about the Conservatory at the Dan'l Webster Inn (tel 508-888-3622), 149 Main Street just a five-minute stroll east from Dexter's Grist Mill. The dining room here is run by a family with a long history of restaurant success. The Conservatory is a grand solarium with high ceilings, views of the grounds, potted indoor trees, servers in period costume, and a bounteous menu, with lots of beef and seafood choices. All three meals are served. On Thursday and Saturday evenings and at Sunday brunch there is a pianist playing. 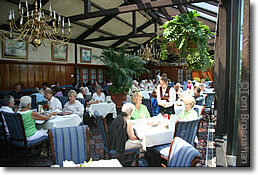 Conservatory dining room of the Dan'l Webster Inn in Sandwich MA on Cape Cod.